Fabric Awning contractors can manufacture, install, maintain, repair, alter or extend detachable cloth/synthetic cover material over a rigid metal designed to be used as a protection against sun and weather. Electrical wiring required for the purpose of lighting the awning may be included in the contract for work, but must be subcontracted to a Certified Electrical Contractor. This exceptionally produced trainee guide features a highly illustrated design, technical hints and tips from industry experts, review questions and a whole lot more! Key content includes: Orientation to the Trade, Building Materials, Fasteners, and Adhesives, Hand and Power Tools, Reading Plans and Elevations, Floor Systems, Wall and Ceiling Framing, Roof Framing, Introduction to Concrete, Reinforcing Materials, and Forms, Windows and Exterior Doors, and Basic Stair Layout. Basic Safety is a short publication used for Prov contractor testing which covers the most important aspects of safety within a job site. The Florida Building Code 6th (2017) edition is the most complete source of code standards and compliance information in the construction industry. It is arguably the single-most important book in the construction industry since it defines the standards with which construction products and installations must comply throughout the construction process. 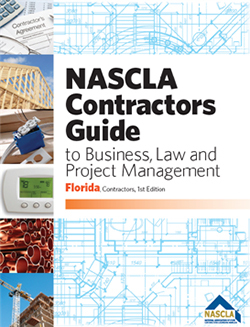 It is for this reason that the Florida Building Code is one of the most heavily-tested reference books in the Florida construction contractor licensing exams.